India and China advised their holidaymakers against visiting the tropical archipelago after a state of emergency was declared by the regime of embattled President Abdulla Yameen. Maldives: The Maldives on Tuesday sought to reassure tourists they would be safe as governments warned their citizens to steer clear of the troubled honeymoon islands amid a spiralling political crisis. Tourism is a key earner for the Maldives but a dramatic confrontation between Yameen and the security forces against the Supreme Court has further eroded its reputation as an idyllic atoll nation. Government spokesman Ibrahim Hussain Shihab said no curfew had been declared and the safety of tourists in the upmarket holiday paradise was assured. The government would "facilitate calm at a time of national difficulty", he added. But China the number-one source of tourists for the Maldives has urged its citizens against visiting the Indian Ocean nation. The warning from China's foreign ministry comes ahead of the "Spring Festival" -- the peak period for Chinese tourists to visit the Maldives. "Given the security situation there, we advise the Chinese tourists who are now in the Maldives to closely follow the security situation and enhance self-protection," Chinese foreign ministry spokesman Geng Shuang told a regular briefing. "In the meanwhile, Chinese citizens are advised to avoid going to the Maldives until the situation on the ground is stabilised." India and France and other European nations also advised its citizens against non-essential travel. 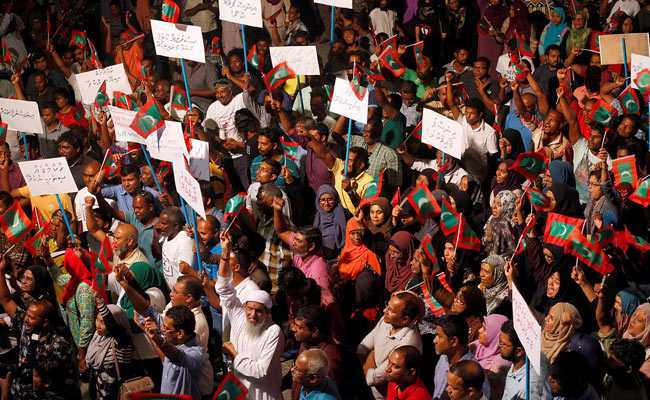 The United States advised caution, warning of further protests in coming days across the capital Male "in response to emerging political developments". "You should avoid areas of demonstrations and exercise caution if in the vicinity of any large gatherings, protests, or demonstrations," the US embassy in Colombo said in its updated travel advice on Tuesday. In the latest escalation of the crisis, police clashed with opposition supporters outside the Supreme Court as troops stormed the building to arrest the chief justice and another judge at dawn Tuesday. Hours earlier, they had arrested the country's former president Maumoon Abdul Gayoom after accusing him of orchestrating attempts to topple his estranged half brother Yameen. President Yameen has refused to comply with a court order to release political prisoners, despite growing international pressure and concern. Political turbulence under Yameen -- who was elected in a controversial run-off in 2013 -- has dented the Maldives' image as an island paradise, but most tourists are insulated from the turmoil in Male. The airport is a short boat journey from the capital and many visitors are whisked away to resorts on remote, serene islands spread 800 kilometres (550 miles) across the equator. Nearly 1.4 million foreigners visiting the Maldives last year, up from 1.28 million the previous year.